The 3341, 3343 and 3345 models are still offered for the 2020 model year. Similar to the 3341, the new 3541 is a quad slide model with a king bed. 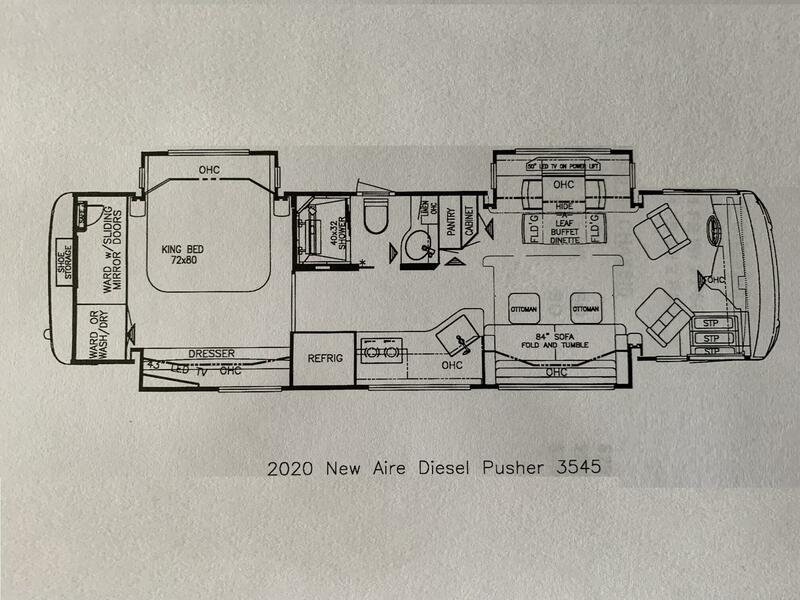 The front living area features a booth dinette with “televator” and kitchen on the off door side, both of which are slightly larger than the ones in the 3341. The door side slide room offers an 84” fold and tumble sofa (instead of 74”) with ottomans and a refrigerator and large pantry. 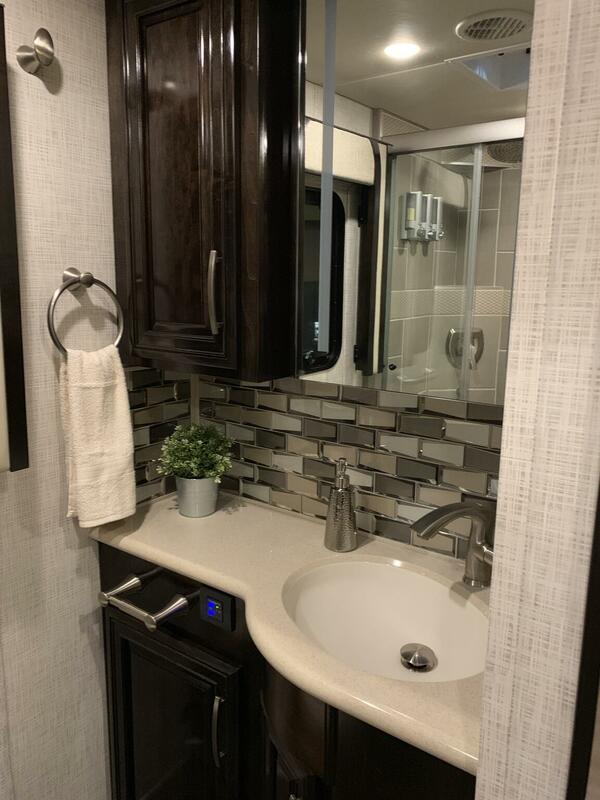 Mid-coach is a large walk through bath area with an enclosed commode and vanity on the off door side and large 40” X 32” glass enclosed shower on the door side. The bedroom highlights include a 72” X 80” king bed across from which is a dresser and television. A large full length wardrobe spans the width of the rear wall of the bedroom and can house an optional 2-piece washer and dryer. 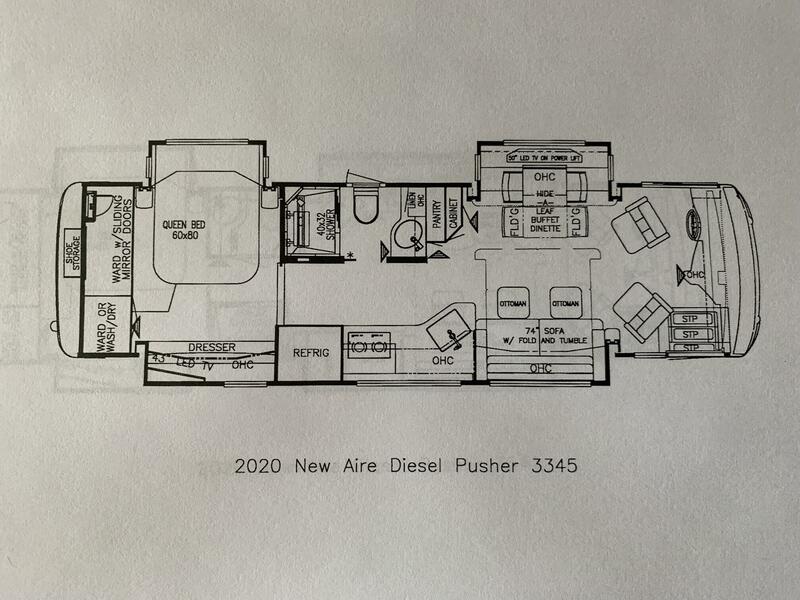 Similar to the 3343, the new 3543 is a triple slide floor plan with a full wall slide on the door side. 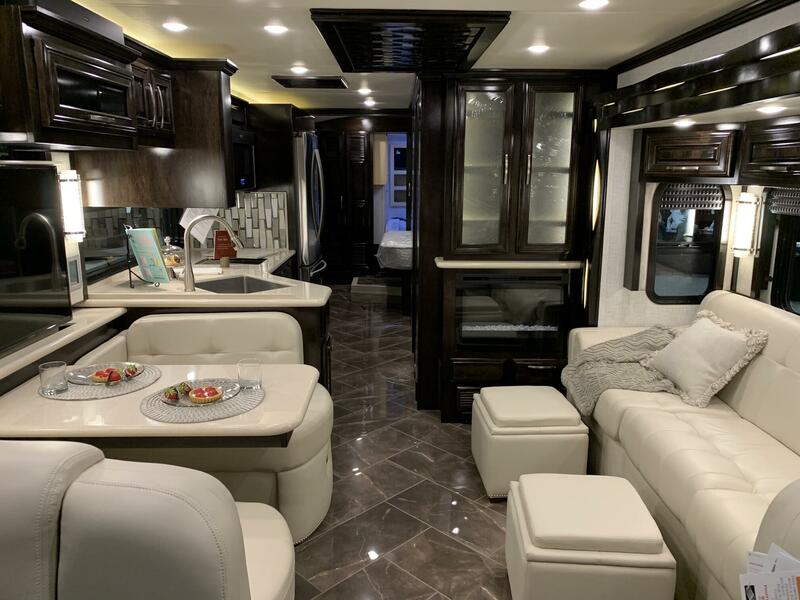 It also features a king bed as well as a dinette facing the patio on the door side of the coach. In front, on the off door side is a large 92” hide-a-bed sofa with ottomans. This sofa is longer than the 87” sofa offered in the 3343 model. 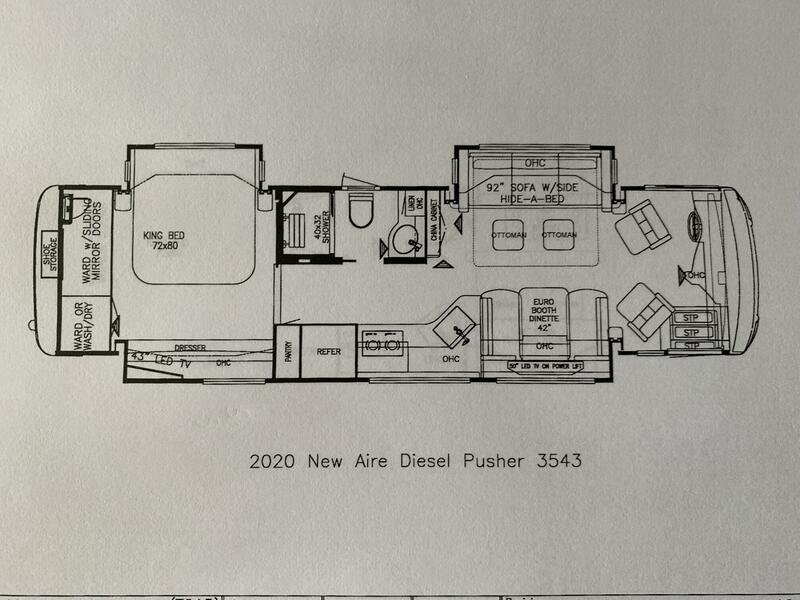 On the door side of this floor plan is a euro booth dinette with “televator” and a galley that is larger than the one offered in the 3343. The enclose bath area is located mid-ship and offers a large 40” X 32” shower, vanity and linen storage. This bathroom is identical in layout but larger than the one offered in the 3343. The new New Aire 3545 is similar in footprint to the 3345 and provides 3 slides with a full wall slide on the door side. 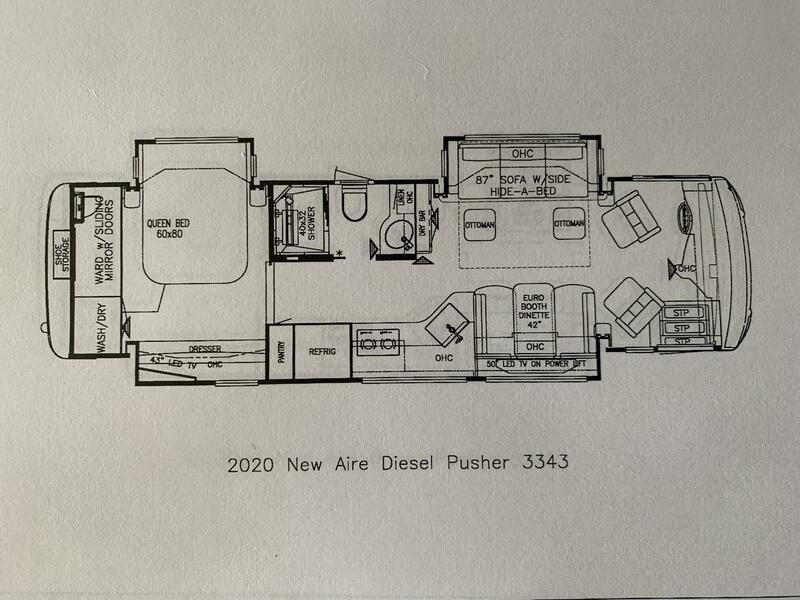 It also features a king bed and dinette on the off door side of the coach. In front, on the door side is a large 84” fold-and-tumble sofa with ottomans. This sofa is longer than the 74” sofa offered in the 3345 model. On the same side, is also a galley that is larger than the one offered in the 3345. 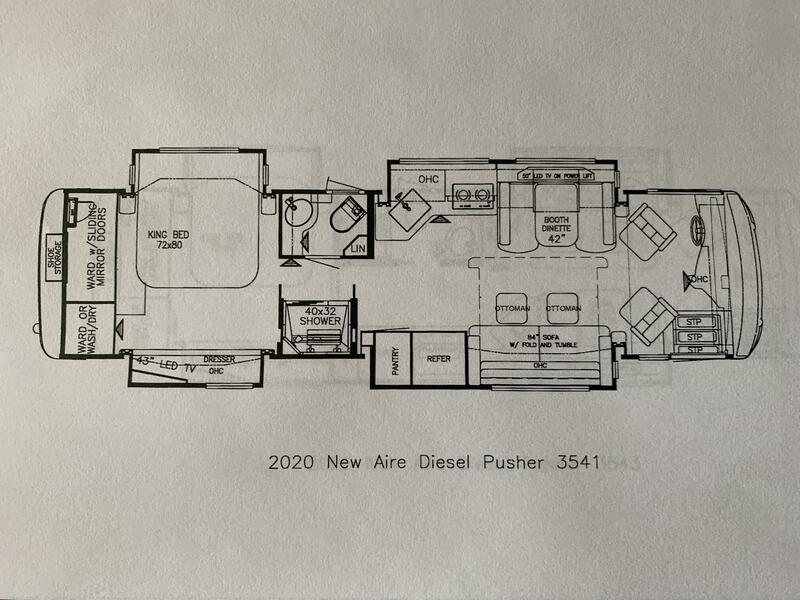 On the off door side of this floor plan is a hide-a-leaf table with 2 fixed and 2 folding chairs with “televator”. The enclose bath area is located mid-ship and offers a large 40” X 32” shower, vanity and linen storage. This bathroom is identical in layout but larger than the one offered in the 3345. The option for two (2) 15,000 BTU air conditioner units with heat pumps (H187) has been made standard on all New Aire models for the 2020 model year. This option was selected on 95% of all 2019 New Aire orders. The Sony brand televisions previously used in Newmar’s gas brands in 2019 have been replaced with Samsung brand models for the 2020 model year. A new model of Tru Induction cooktop is featured in the galley of the 2020 New Aire, as the previous model cooktop has been phased out. The 2020 New Aire offers soft closing side hinged cabinet doors, similar to those introduced in the King Aire in 2019. Furniture seating in the 2020 New Aire will be covered in high quality Ultra-leather material, an upgrade to that offered in 2019. 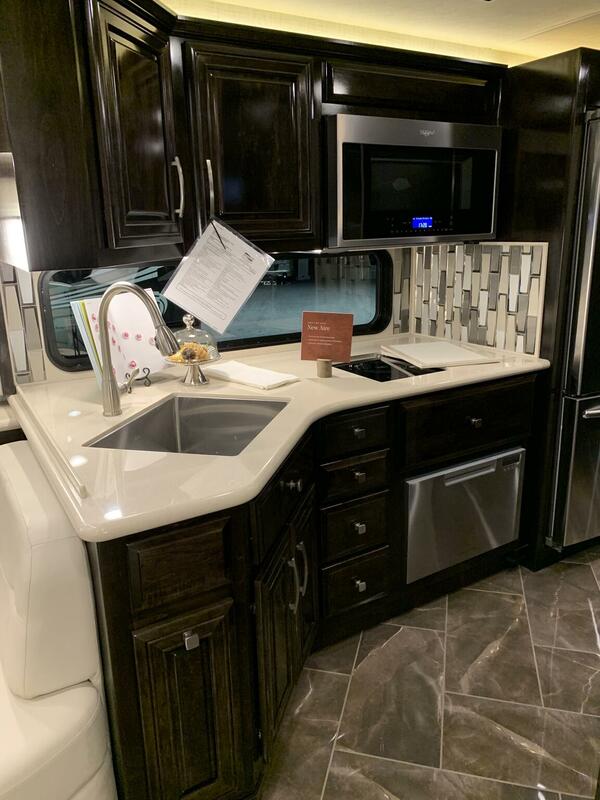 A pull out in the kitchen overhead cabinet, similar to those offered in other Newmar luxury coaches, will be featured in the galley area of each floor plan. An 84” fold and tumble sofa has been developed by Flexsteel for the new 3545 New Aire model. There are travel latches on the pantry doors of the 2020 New Aire. 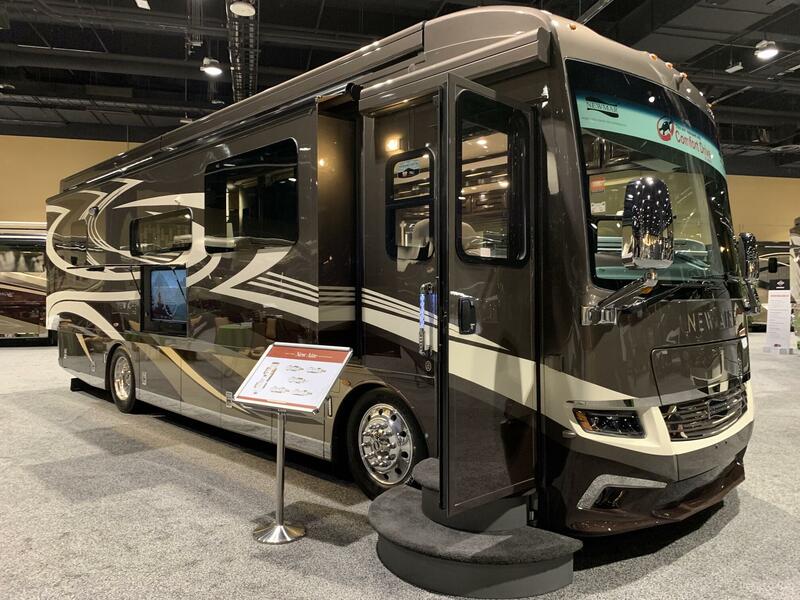 A new chassis, 24” longer in length than the existing platform, has been developed by Newmar and Freightliner for the new 35’ New Aire floor plans for 2020. The Cummins L9 with 450 h.p. will be featured on this new longer chassis. Transmission controls are now on the steering wheel stalk. Engine brake controls are also located on the steering wheel stalk. The fuel tank on all 2020 New Aire models has been increased to 90 gallon capacity. An electric switch has been added to the brake pedal for push button start authorization. This eliminated the need for air pressure in order to start the ignition using the push button start as previously required on 2019 models. Tire pressure monitoring system is a new standard feature on all 2020 New Aire models. On Guard collision mitigation and adaptive cruise control are standard feature on the 2020 New Aire. The Silverleaf system will feature a new larger screen. 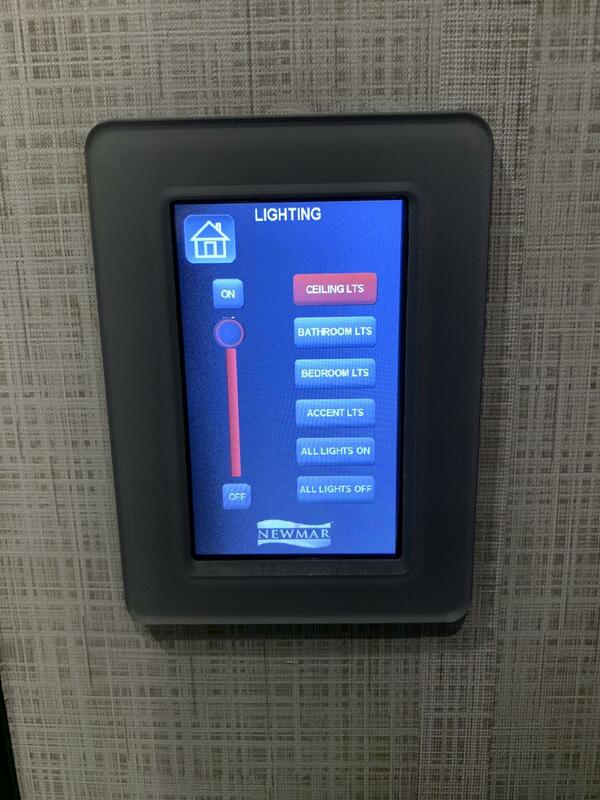 Lights and shades are controlled from larger display panels (rather than individual switches), with most lights having the ability to be dimmed. The front hood of the 2020 New Aire uses struts instead of a prop to hold it open. A newly designed lighted grab handle with spiral lighting will be a new features at the entry door. The 2020 New Aire will feature new exterior graphic and paint colors. LED strip lighting above the kitchen slides will include lighting above the sofa and dinette areas. Some of the interior decors are new for the 2020 Aire. Shoe storage in the rear cap in now a standard feature in New Aire as this option was selected 94% of the time last year. 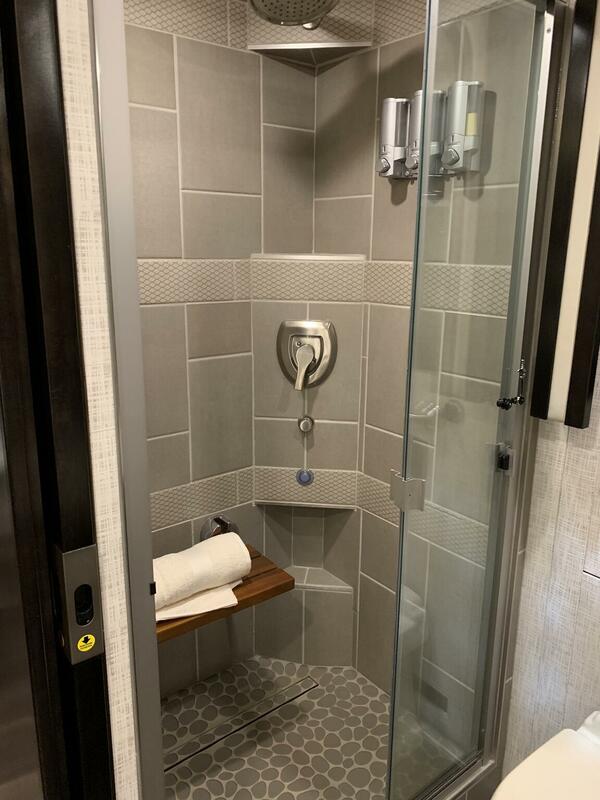 A foot prop and soap dispenser have been added in the corner of the shower. The shower walls and pan in the bath area of all 2020 New Aires will be laid in tile rather than using solid surface for these areas. A larger 105 gallon fresh water tank is a new key feature on the 2020 New Aire. 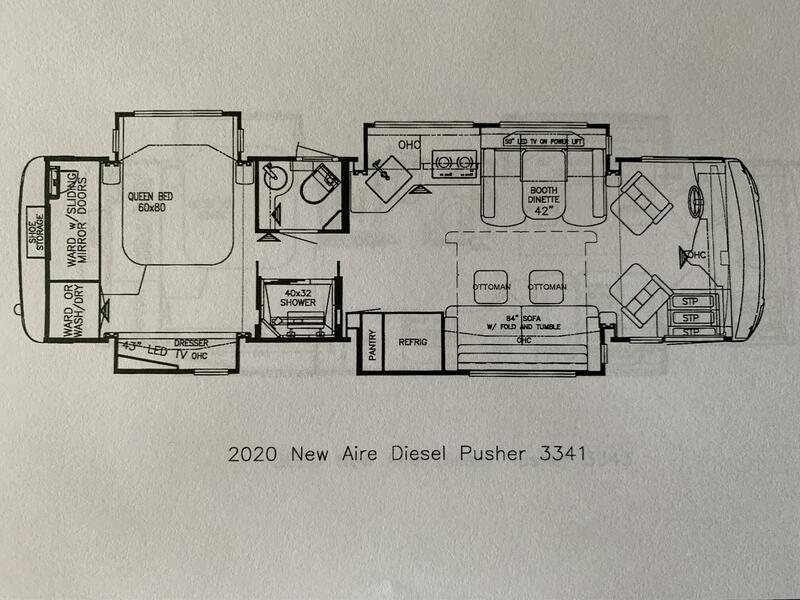 In specific 2020 New Aire floor plans, larger non-opening windows in the Living room and dining areas are a new highlight. These windows allow more light to come into the coach and greatly enhance the view outside the motor home. A universal toll module is a new option available on New Aire for 2020. A new option for a passenger side monitor at the console (similar to what has been offered in King Aire and Essex) is available for the 2020 New Aire. LED strip lighting under all slides on the off door side of the 2020 New Aire is a new available option. A new Villa Comfort Fit convertible dinette booth is a new available option (option #L282). This replaces the booth dinette offered in 2019. The solar panel option will provide four (4) panels in place of the three (3) panels provided in 2019.